DANVERS, Mass.--(BUSINESS WIRE)--In a milestone for scientific research, Abiomed (NASDAQ: ABMD) has now invested more than $100 million over the past five years in clinical research on the Impella heart pump platform. Abiomed’s commitment to clinical research is detailed on a new webpage that launched today. Abiomed-sponsored research is augmented by two decades of independent physician-led research initiatives and a total of more than 550 peer-reviewed academic papers. Those studies have confirmed the hemodynamic benefits of Impella, which directly unloads the left ventricle and enables heart recovery. As a result, Impella is included in eight clinical guidelines¹ and has regulatory approvals that include European CE Mark, Japanese PMDA, and the highest level of regulatory approval from the US FDA, the PMA. 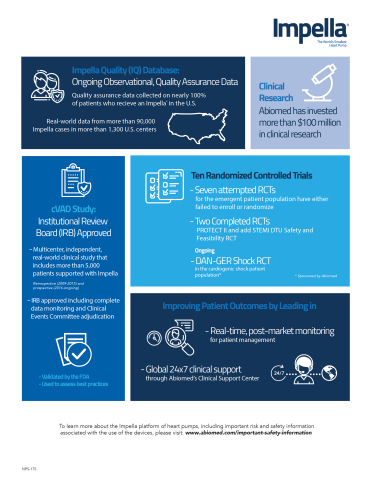 The Impella Quality Assurance (IQ) Database, which collects, and shares with independent academic researchers for analysis, real-world outcomes data on nearly 100% of Impella patients from more than 1,300 U.S. centers. Data from the IQ Database helps continuously improve outcomes by, for example, demonstrating the benefits of placing Impella prior to revascularization in cardiogenic shock, as detailed in an Impella Update issued to physicians today. The FDA-audited cVAD Study, a prospective study with one year follow up. The cVAD Study contributed to the development of the physician-led National Cardiogenic Shock Initiative which demonstrates that when best practices are followed, including the placement of Impella pre-PCI, survival in cardiogenic shock can improve from ~50% to 77%. Real-time monitoring of patients on Impella support through industry-leading 24x7 clinical support services. These include 24-hour on-call, on-site support and the cloud-based Impella Connect system, which lets clinicians and experts from Abiomed’s Clinical Support Center remotely monitor patients in real-time to help improve outcomes. Ten attempted or completed randomized controlled trials of Impella (two completed, seven attempted and one ongoing). This includes Abiomed’s support of the ongoing Dan-Ger Shock randomized controlled trial for cardiogenic shock, which compares Impella CP use to other types of circulatory support. Six FDA studies, with five post-market approval studies underway. These studies have demonstrated best practices for improving patient outcomes, and established Impella as the most cost-effective FDA-approved therapy for native heart recovery by reducing length of stay, repeat procedures, and total cost of patient care. Partnerships with leading academic institutions to explore new elements of cardiac physiology such as the delivery of gene therapy vectors to failing hearts, algorithms to detect and predict patient-specific hemodynamics and how unloading the ventricle prior to reperfusion may trigger cardioprotective signaling. STEMI-DTU pivotal randomized controlled trial, which will compare unloading the left ventricle with Impella to the current standard of care. The ongoing Dan-Ger Shock randomized control trial for cardiogenic shock. Ongoing data collection, monitoring and analysis for the IQ Database, cVAD Study and five FDA post-market studies. Impella is the only FDA approved, safe and effective device for high-risk PCI, cardiogenic shock, and right-side support. Unlike the majority of FDA cleared medical devices, including the intra-aortic balloon pump and ECMO, Impella’s indications are backed by a randomized controlled trial, Protect II, demonstrating safety and efficacy. More than 100,000 patients have been treated with Impella in the U.S., Germany and Japan, including Tim Deits, a teenager who went into cardiogenic shock after collapsing at his home in Huntington Beach, California. He was rushed to the hospital and treated with an Impella CP and an Impella RP, which allowed his heart to rest and recover. 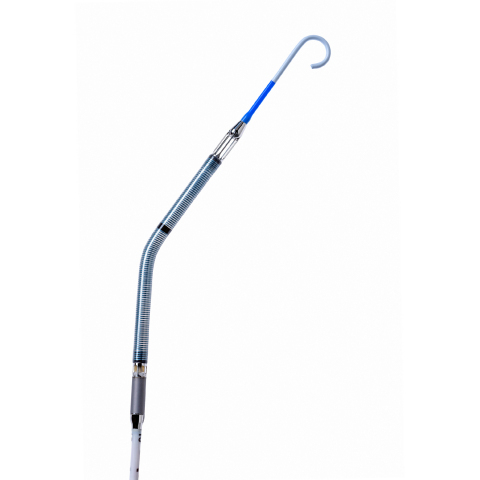 The Impella 2.5 and Impella CP devices are FDA approved to treat certain advanced heart failure patients undergoing elective and urgent percutaneous coronary interventions (PCI) such as stenting or balloon angioplasty, to re-open blocked coronary arteries. The Impella 2.5®, Impella CP®, Impella CP® with SmartAssist, Impella 5.0® and Impella LD® are FDA approved heart pumps used to treat heart attack or cardiomyopathy patients in cardiogenic shock, and have the unique ability to enable native heart recovery, allowing patients to return home with their own heart. To learn more about the Impella platform of heart pumps, including their approved indications and important safety and risk information associated with the use of the devices, please visit: www.protectedpci.com. The ABIOMED logo, ABIOMED, Impella, Impella 2.5, Impella 5.0, Impella LD, Impella CP, Impella RP, Impella Connect, and Recovering hearts. Saving lives. are registered trademarks of ABIOMED, Inc. in the U.S. and in certain foreign countries. Based in Danvers, Massachusetts, Abiomed, Inc. is a leading provider of medical devices that provide circulatory support. Our products are designed to enable the heart to rest by improving blood flow and/or performing the pumping of the heart. For additional information, please visit: www.abiomed.com. This release contains forward-looking statements, including statements regarding development of Abiomed's existing and new products, the Company's progress toward commercial growth, and future opportunities and expected regulatory approvals. The Company's actual results may differ materially from those anticipated in these forward-looking statements based upon a number of factors, including uncertainties associated with development, testing and related regulatory approvals, including the potential for future losses, complex manufacturing, high quality requirements, dependence on limited sources of supply, competition, technological change, government regulation, litigation matters, future capital needs and uncertainty of additional financing, and other risks and challenges detailed in the Company's filings with the Securities and Exchange Commission, including the most recently filed Annual Report on Form 10-K and Quarterly Report on Form 10-Q. Readers are cautioned not to place undue reliance on any forward-looking statements, which speak only as of the date of this release. The Company undertakes no obligation to publicly release the results of any revisions to these forward-looking statements that may be made to reflect events or circumstances that occur after the date of this release or to reflect the occurrence of unanticipated events. Abiomed has now invested more than $100 million over the past five years in clinical research on the Impella heart pump platform.